There was a point, during the two years of legal proceedings that would overtake, and then shatter, both of their lives, when Bob Swartz and his son Aaron found themselves with a bit of free time. They had arrived at the Federal Reserve building, in Boston, to meet Aaron’s lawyer—one of dozens of meetings Bob would arrange in hopes of fending off the 13 felony counts against his son. But they were early, so they took a walk. Aaron was Bob’s first child, the oldest of three boys, and he was a fragile, thoughtful kid from the very beginning. Growing up, Aaron and his brothers, Noah and Ben, had unfettered access to the nascent Internet, creating and coding projects of their own design. Evenings were spent building robots with Legos, playing Myst or Magic: The Gathering. Dinner-table conversations might concern the merits of a particular font, or Edward Tufte’s theories of information. “It was a house of ideas,” Bob says. Aaron taught himself to read at age three, and became bored with school shortly thereafter. By ninth grade he became an anti-school activist, arguing that rote drills and homework assignments couldn’t teach kids how to think. Instead, he chose to be “unschooled,” documenting his progress on a blog he called Schoolyard Subversion. “He lived more of his life online than he did with his friends,” Bob says. “There was a degree of alienation that occurred, especially as he got older. He was working on the Internet and that was sort of terra incognita.” But Aaron found a network of friends online—many far older than he—who shared his interest in the future of the Web. Bob understood his dark-eyed, curious son’s enthusiasms. They spent time together in their Highland Park home, bonding over books as Aaron mowed through the family’s canon. One summer, they cataloged several thousand of their books according to the Library of Congress classification system. One night a fight erupted over standards. Aaron won. Another time, Bob took Aaron to the Crerar Library at the University of Chicago, just as his own father had once taken him. Bob led Aaron through the stacks, pulled a book off the shelf, and cradled it in his hands. It was from the 1800s, a marvel. He told his son libraries were portals into the knowledge of the world. Whenever Aaron needed advice, his father would share an insight from life or literature. “You always answer things in stories,” Aaron would say. That afternoon, as Bob and Aaron circled the block, they discussed the events of the past few months—Aaron’s arrest, when he was forced to the pavement; his strip search and solitary confinement upon arraignment; the increasingly circuitous route the U.S. Attorney’s Office was taking in negotiating the charges; their legal fees, which would soon clear $1 million; the looming felony conviction that Aaron feared. Aaron said he felt as though he’d been living in a version of The Trial, Kafka’s classic novel, which follows the incoherent prosecution of a defendant named Josef K.
Bob had admired Kafka, but didn’t remember the plot of The Trial. He asked Aaron to remind him how the story ended. Aaron just stared at him. 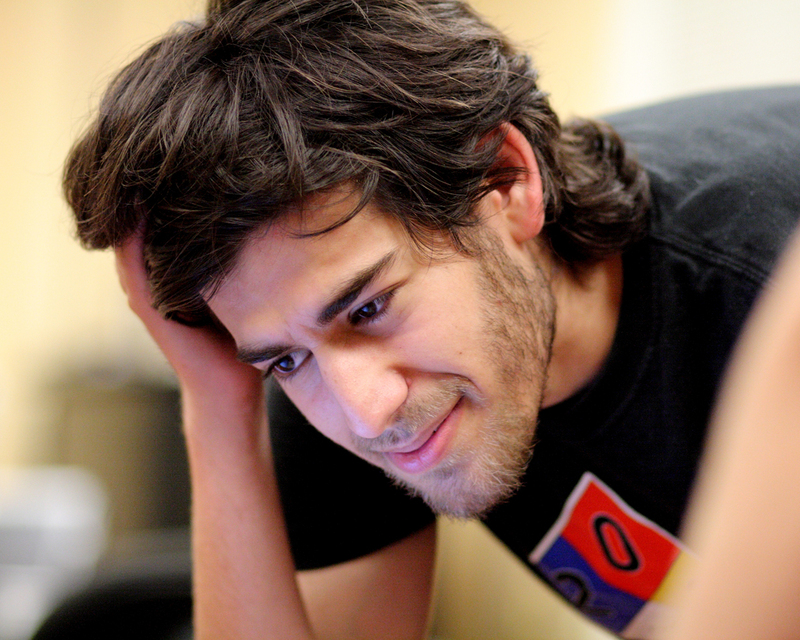 Just a few months later, on January 11, 2013, nearly two years from the date when he was first arrested by a Secret Service agent in Central Square, Aaron Swartz hanged himself in his Brooklyn apartment. He was 26 years old. MIT may be the world’s most prestigious engineering school, with touchscreen maps installed in its building lobbies, but it remains a remarkably difficult place to navigate. To find room 485 in the Media Lab building, you pass through a series of silver double doors, then skirt a workshop where a garden of mechanical flowers gleam purple and silver under iridescent lights. There are no bumper stickers or flyers taped to the hall window of room 485; the blinds are closed. The only sign it’s occupied at all is the magnetic poetry on the door. Most of the tiles are a random scramble, but nine have been arranged to form the lines: Construct the future to be better for your children. Bob lives in Highland Park, Illinois. For more than a decade, he has traveled to the MIT campus each month to consult on intellectual-property aspects of Media Lab creations. After Aaron’s arrest, these trips took on a new urgency: He had to file motions, meet with attorneys, plead with MIT administrators. Now, in the wake of his son’s death, coming here has become an exercise in grief. 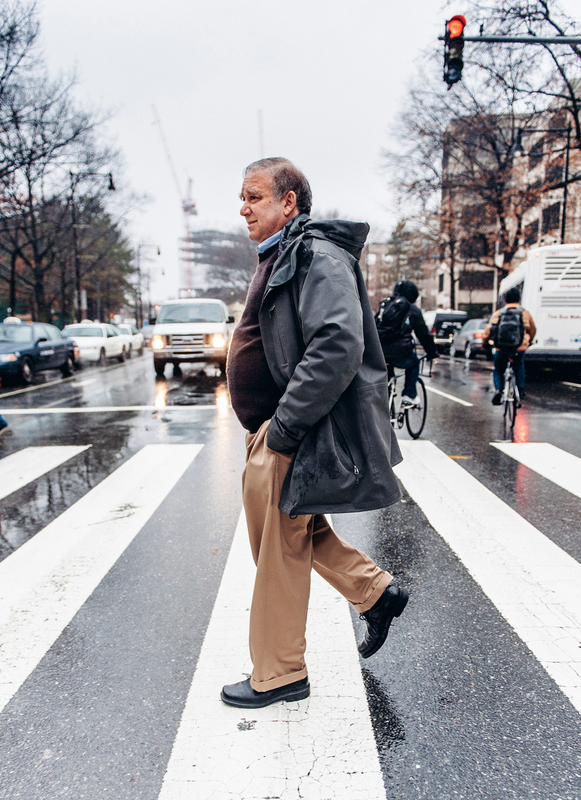 In March, Bob made his way back to campus for Aaron’s memorial service. He wrote the words he would speak that day in his office in the Media Lab building. Dressed in a dark-gray suit, he stood at the podium and cited the work of other digital visionaries who flouted the law: Steve Wozniak and Steve Jobs, Bill Gates, Mark Zuckerberg, and the founder of Polaroid, Edwin Land. 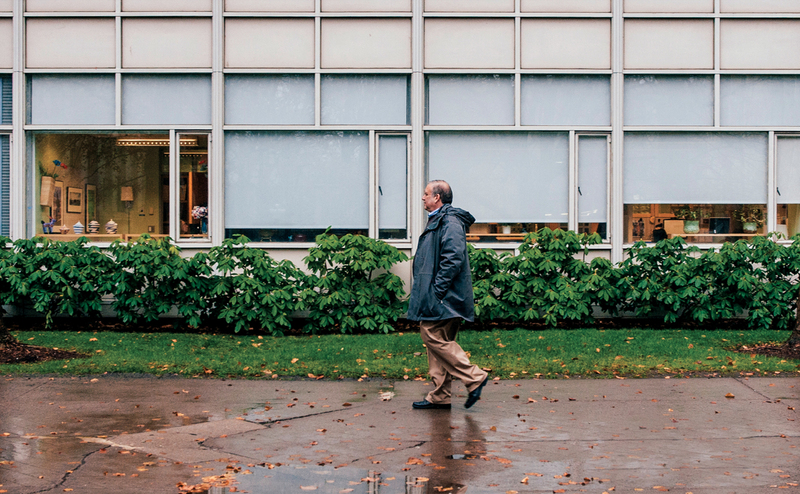 “These people did exactly what MIT told them to do, they colored outside the lines…but today’s MIT destroys those kinds of people,” he said. It was supposed to be the work of a ghost. In late 2010, after creating the fake user profile Gary Host—shortened to “ghost” on the email login—Aaron began downloading files from JSTOR. Sometime in November, he left a laptop hidden in a basement utility closet in MIT’s Building 16, where it could conceivably continue to download for days without notice. When JSTOR noticed the bulk downloads, it blocked the ghost email address, and notified MIT. But the downloading continued, and JSTOR locked MIT out of its archives. On January 4, 2011, campus police found the laptop in the closet and called Cambridge police. The detective who took the call was also a member of the New England Electronic Crimes Task Force, which includes representatives from the U.S. Secret Service. In short time, a host of officers descended on campus. They were unsure of what exactly was under way, but they suspected an international breach: When the Secret Service arrived, Bob says, the first thing they asked was whether any of the university’s classified research was threatened. Officers placed a video camera in the closet, while the Secret Service agent on the case, Michael Pickett, asked the school’s Information Services & Technology staff for relevant electronic records. Without a subpoena, attorneys in MIT’s Office of the General Counsel released the materials to Pickett. The suspect returned to the closet later that afternoon, but when MIT police arrived he was gone. Only the camera saw him: a lean young man with dark, shoulder-length wavy hair, wearing a dark coat, a gray backpack, and jeans, and carrying a white bike helmet. Two days later, after those images had been distributed to MIT police, campus officers were alerted that someone had entered the closet yet again. They watched via video feed as their suspect removed the laptop, this time with a bike helmet obscuring his face. Later that day, MIT police captain Albert Pierce spotted a young man who resembled the suspect biking through campus on Vassar Street. Pierce followed the suspect north on Mass. Ave. through Central Square, eventually overtaking him just past the intersection. He called for backup, and another MIT officer and Special Agent Pickett quickly responded. Pierce pulled up alongside the cyclist, showing him his badge and ID. The suspect said he didn’t talk to strangers and that Pierce wasn’t a “real cop,” then ditched his bicycle, taking off toward Central Square. Pierce tried to chase him on foot, but returned to his car. By then, the other officers had arrived, and the two cars followed the suspect onto Lee Street. 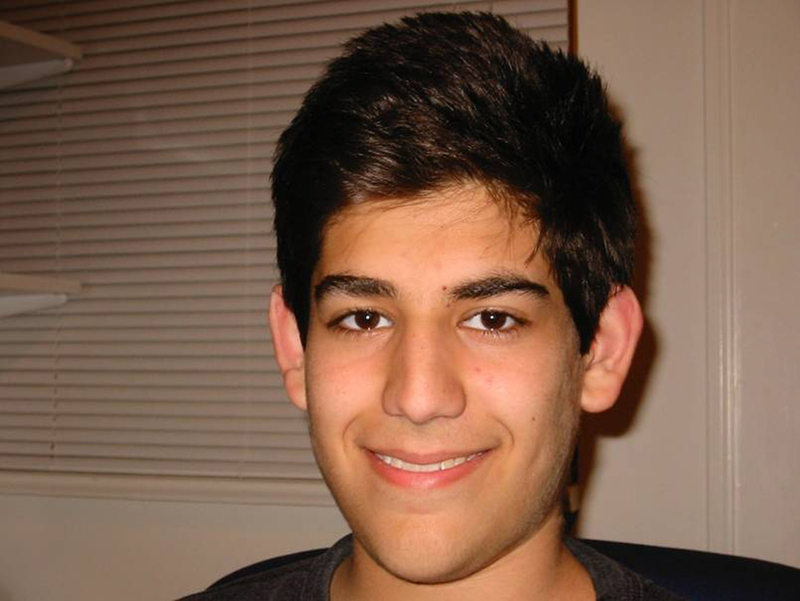 Aaron Swartz was apprehended on a quiet block about a mile from MIT’s campus, in front of a row of stately three-story townhomes. Special Agent Pickett put him in handcuffs. He was charged with breaking and entering in the daytime and with intent to commit a felony. He was just a few blocks from home. Bob was walking off a plane in San Francisco when his wife, Susan, called him with the news: “Aaron has been arrested at MIT.” Bob called Aaron immediately. He said he’d been roughed up, that officers took his bike, backpack, and laptop. “He sounded scared,” Bob remembers. Bob was alarmed, but this wasn’t Aaron’s first brush with the law. Four years earlier, the FBI had investigated Aaron for a bulk download of the Public Access to Court Electronic Records (PACER) website, a government-run court archive. The open-government activist Carl Malamud believed that public documents should be free to the public, and encouraged activists to liberate the files through a free trial PACER was offering libraries. Aaron told Malamud that he’d written a script that could make downloads outside the library network, but Malamud told him to stick to the appropriate channels. Aaron went ahead and used his script anyway, downloading some 2.7 million files. This time felt different. A few weeks after his arrest, law enforcement told Aaron he could come pick up the possessions they had confiscated. Aaron called Bob: “Dad, will you come with me to pick up my bike?” he asked. Bob and Aaron walked to the Vassar Street headquarters of the MIT police. As they sat in the station, looking through bullet-proof glass, “It was like, what are we doing here?” Bob remembers. Aaron was miserable and depressed. The MIT cops returned his helmet, backpack, and bicycle, but kept a USB drive that he had used for the downloads. “Now it’s up to the Secret Service,” Bob remembers the cop saying. In open-access corners of the Internet, Aaron’s fellow hackers still search for an answer: What had he planned to do with the downloaded files? Most acts of civil disobedience are done publicly, without ghost logins or hidden laptops. Aaron could have done his downloading in the open: MIT’s open-network policies at the time allowed anyone visiting campus to access services like JSTOR. That openness, coupled with the university’s celebrated history of hacker culture, could have led Aaron to think he’d be more likely to be chastised than indicted. But it doesn’t explain why he resorted to clandestine maneuvers. Only Lessig, who for a short time served as Aaron’s lawyer, has said he knows for certain what Aaron’s plan was. But he’s not sharing. Instead, he has dropped coy hints. In a lecture at Harvard shortly after Aaron’s death, he floated possible scenarios. In one, Aaron was planning to release the files to third-world countries. Another theory: He planned to analyze the data to search for evidence of corrupt science, just as he had done with a legal database under Lessig’s guidance at Stanford. But the reasons didn’t matter in the end, he says. He knows they hardly mattered to the prosecution. The real question is this: Did Aaron know, that fall, the danger he was putting himself in?